Fluffy Corned Tuna Omelette Recipe – Eats Yummy! I was craving for a good food, and thought of cooking spicy corned tuna. I thought of giving it a little twist by turning it into an omelette. Then I have read something delightful on how to make it fluffy. An easy recipe to follow, really. 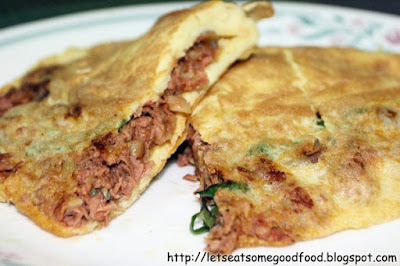 So there I was cooking a good food, Fluffy Corned Tuna Omelette, with my own simple recipe. Ana and my sister tasted it, and they said it was indeed a good food, and I won’t disagree. Love your own perhaps. Haha! 150g can corned tuna – although I used the spicy variant, you may use the original flavor one. Separate the egg whites and the yolks. Put the egg whites in a bowl and separate the yolks aside. Briskly whisk the egg whites until they become a bit bubbly. Be careful not to whisk too much making it too much bubbly. Add some salt and put the egg yolks in the bowl, slowly combining it with the whites. Heat 1 tbsp oil in a non-stick pan. Saute garlic for few seconds and then add onions and beans. Saute for few minutes until the beans become tender. Add the corned tuna and mix it with garlic, onion and beans. Add some salt and pepper. Heat 1 tbsp oil again in the same pan and transfer the egg mixture. Spread evenly. Use a spatula or a slotted turner to see if the bottom is already starting to crust. If it is, then lower the heat and let the egg cook. Make sure it is still light and fluffy. Add the filling and some spring onion and then fold the egg. You may or may not turn it over to cook the top part. your site is looks great with all the yummy foods:) I added your site. pls do the same , thanks! I think I want to taste, I like spicy food. i will try this recipe. affordable and looks good talaga. . Thank you. We will try to cook one with those and will post one soon.